Oil painting on canvas by Grant McSherry. 1400 mm x 927 mm. ‘The boys’ is my second oil painting about Newfoundland dogs. I enjoyed creating the first of my Newfoundland paintings ‘Someone to watch over me’ and was keen to produce a second, this time less about the landscape and more about the dogs. 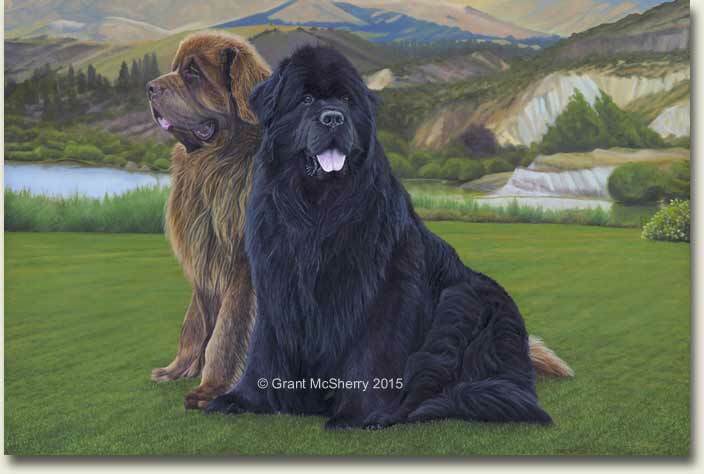 In fact, while representing the Newfoundland dog breed “The boys’ is unashamedly a portrait of our two Newfies Henry & Enzo. The imagery for this oil painting originated in a holiday to the Lakes District in 2013, where we enjoyed lots of day trips. 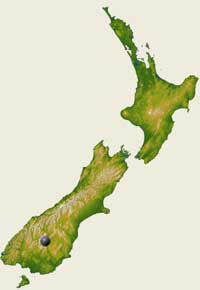 One of those trips was to Bannockburn, Central Otago, one of New Zealand’s wine Meccas. The people at Carrick kindly let us do a quick photo shoot on their pristine grounds (Carrick is well worth a visit or better yet a stop in for lunch and wine tasting if you are in the district). As there was no single photo that represented both our Newfs well I worked from a combination of two reference photos to enable me to try to capture aspects of the personalities of Henry & Enzo, our Newfoundland dogs. At the time I shot the reference pics Henry (the black Newfy) was seven years old and Enzo five. When I finally completed the painting Henry was nine and Enzo seven. The two are best mates and are inseparable. I began work on this Newfoundland dogs oil painting in October 2014 and completed the work in June 2015, in between going to work and all the jobs that need to be done around home. We are very pleased to offer just 195 Giclee fine art prints on canvas of this work. The original is not available for sale. Often referred to as gentle giants, Newfoundland dogs are renowned for their prowess in water and are still involved in water rescue work in some parts of the world. 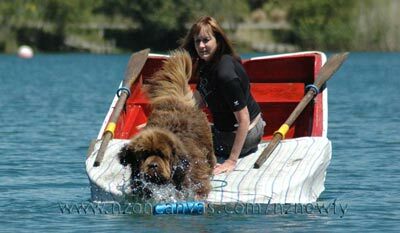 The breed often displays a natural tendency to pull people from the water and Newfies will even tow a small boat back to shore to ‘save’ the occupant. 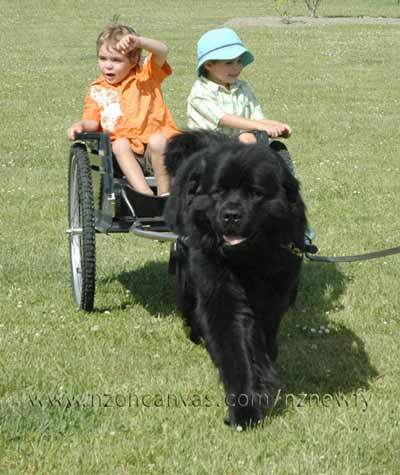 The Newfoundland dog has huge webbed feet and a big soft coat that gives buoyancy and warmth in cold water. When swimming, Newfoundlands use their great tales as rudders. The breed originates from Newfoundland, Canada, where the massive dogs were originally employed for bringing in the fishing nets and then hauling the catch to town in carts. Newfoundland dogs are very powerful draft animals. White and black Newfoundlands were named after the famous British artist Sir Edwin Landseer, who popularised the breed through his paintings that celebrated Newfoundlands as water rescue dogs, so there is a well established link between art and my favourite breed of dog. To find out more about Newfoundland dogs, or if you are a Newfy fan like us you may want to visit the Newfy section on our website, which includes a blog that has been running ever since our black Newf ‘Henry’ was just five days old. Original painting size: 1400mm x 927mm.